Indie Retro News: Indie Retro News & RGDS Podcast Amiga DOS Special! Indie Retro News & RGDS Podcast Amiga DOS Special! I'm sure many of you will agree with me, but Aaron White is becoming a bit of a legend in the Amiga scene. He has done countless albums now going right back to 2014. From C64 remixes and 80's tracks, to Amiga PDs and even a more recent Sega Master System Hits Vol 1. But for me although these are mighty fine releases, I always like to challenge people to push their skills to the limit. So I said to him, " Can you convert PC MS-DOS tracks to the Amiga and if so, can you convert these? " 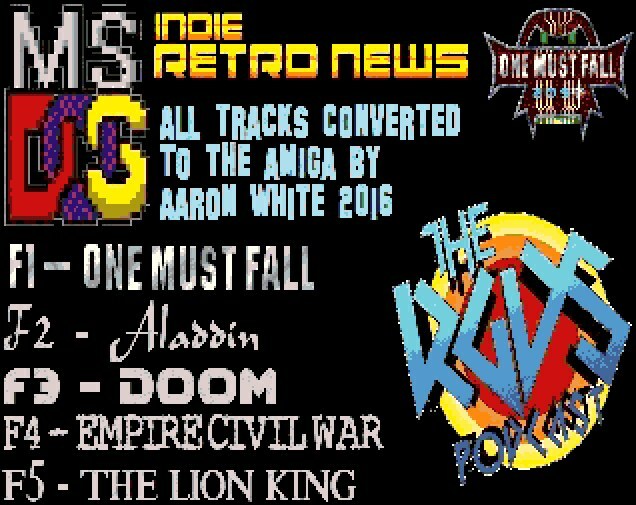 Sure enough after some teasing over the weekend, here we have ' The Indie Retro News and RGDS Podcast Amiga DOS Special ' from Aaron White of RGDS Podcast. A small part 1 album, with remixed game soundtracks such as One Must Fall, Aladdin, Doom, Empire Civil War and The Lion King. In all I'm highly impressed with what Aaron White has achieved, converting tunes such as these were no small task. But for those of you who want more, he is working on a volume 2 album!